Add this to the list of bizarre items airline passengers have tried to carry onto planes. Transportation Security Administration officers recently stopped a traveller who tried to board with a 3D-printed handgun in his carry-on luggage. The replica firearm – discovered at a security checkpoint at Reno-Tahoe International Airport in Nevada – was loaded with live ammunition, said the TSA. The TSA published photos of the gun and genuine ammunition on its blog in its weekly round-up of firearm discoveries at US airports. It wrote: ‘One of the 68 firearms discovered in carry-on bags this week was a printed firearm. ‘It was assembled with parts made from a 3D printer. The gun did not have a firing mechanism. 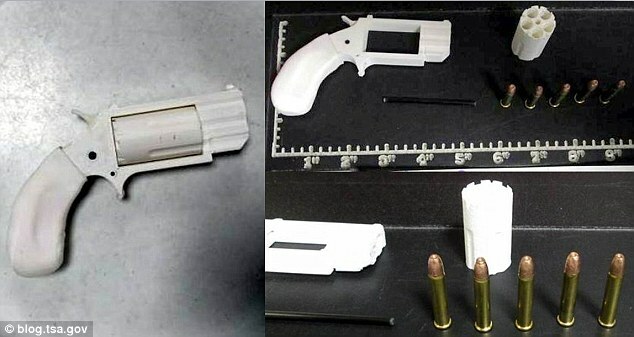 Firearms are permitted in checked luggage, and the TSA tells travellers to check local laws before they travel with a 3D printed firearm. TSA agents are on pace to find a record number of firearms in passengers’ hand luggage. 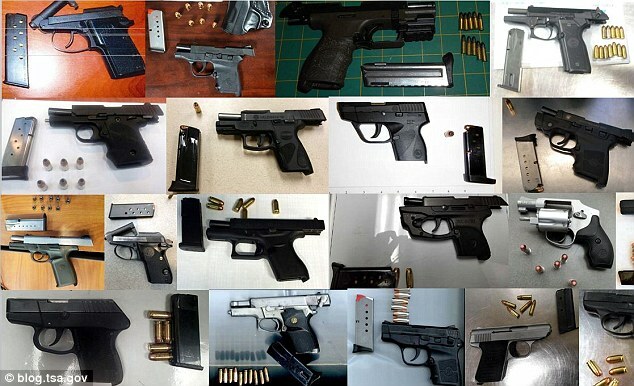 Last year they discovered 2,653 firearms at TSA checkpoints across the country. This year they have already found approximately 1,820 as of August 4. Of the 68 firearms found between July 29 and August 4, 60 were loaded and 21 had a round chambered, the TSA said.